It's always more fun to get your exercise with friends than by yourself. 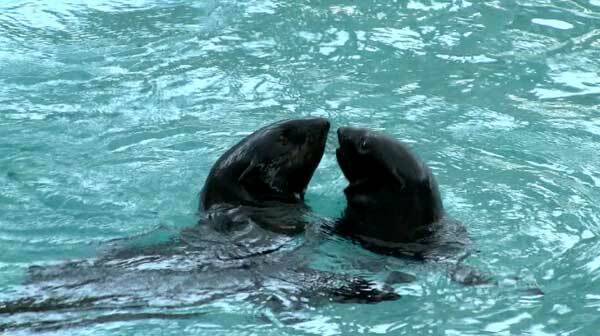 At least our Northern fur seal pups, Leu and Flaherty, seem to feel that way. In the video below, you can see the two youngsters playing a kind of king of the hill game in the New Balance Foundation Marine Mammal Center, with Flaherty on deck and Leu in the water. The two are pushing and shoving much like seals and sea lions do in the wild. In this video, Flaherty is trying to defend the high ground of the deck. See what happens and who ends up being king of the deck. As you can see, this jousting involves open-mouth playful grabs and lunges. You could say it's the seal version of arm wrestling and probably helps them learn how to protect themselves and their territory. You can also see who gets the last laugh—Isaac!